The full breakdown of special adviser movement. Note: an asterisk denotes change due to Lena Pietsch’s return from maternity leave; SSoS refers to ‘Senior Secretary of State’. 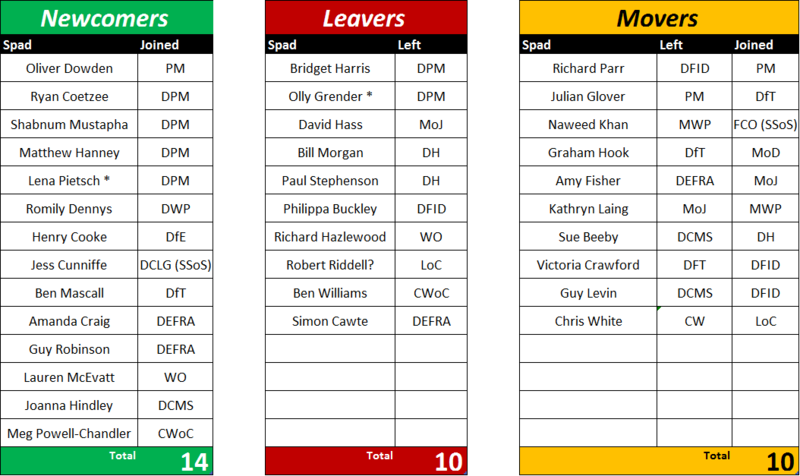 Last Friday, the Cabinet Office published the first list of special advisers (spads) in post since the September 2012 reshuffle. It appears they were uploaded at 7.08pm that night. An hour earlier, Andrew Mitchell had resigned his post as Chief Whip. Mitchell had only just appointed a new spad, Meg Powell-Chandler, and he may have been planning to appoint another. Since spads’ appointments are technically terminated when their appointing Minister leaves office, Powell-Chandler’s tenure was abruptly cut short. Andrew Mitchell’s replacement as Chief Whip is Sir George Young, who left the Cabinet only six weeks earlier. His return brings the possibility that Robert Riddell, his spad as Leader of the House (2010-12), will make a return to government. Young is unlikely to keep on Powell-Chandler or appoint anyone else, because the Chief Whip under Coalition has so far only taken on one on spad, giving the other ‘slot’ to their deputy from the partner party. Since the reshuffle, a couple of significant appointments have been made at the centre of government, with Oliver Dowden and Ryan Coetzee being brought in to the Prime Minister and Deputy Prime Minister’s offices, Dowden as Deputy Chief of Staff And Coetzee as Clegg’s chief strategy spad. Some line departments now have more than two spads. Michael Gove and Iain Duncan-Smith now have three spads each. Another impending appointment means that BIS will now have four spads in the department: two for Vince Cable, two for the Conservative ‘junior’ ministers, Michael Fallon and David Willetts. Jeremy Hunt has kept one of his spads from DCMS, Sue Beeby, and has agreed to appoint a second spad, Sam Talbot-Rice. Talbot-Rice is not included on Friday’s release because he had not started in his post. The Constitution Unit understands that he will take up his post on November 19 and will act as Hunt’s ‘policy special adviser’. Chris Grayling (MOJ) and Maria Miller (DCMS) are two Secretaries of State likely to hire a second spad soon. Both of Andrew Lansley’s spads at DH have left the government, unique among spads with reshuffled ministers. The only spad to leave their post without their minister being reshuffled was Bridget Harris. She was one of the six Lib Dem ‘departmental’ spads appointed to monitor developments across government, reporting to Nick Clegg. Three spads have moved to work for different ministers in different departments. 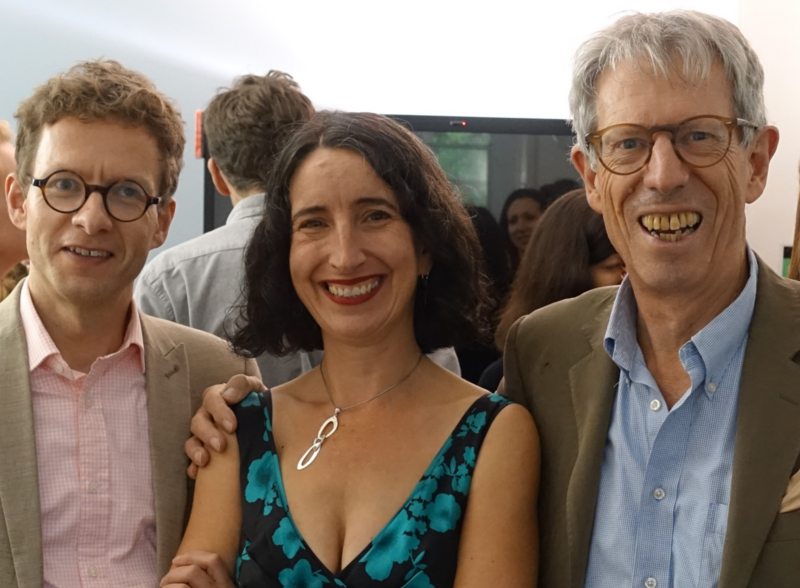 Amy Fisher has moved from Defra to MOJ; Victoria Crawford from DFT to DFID; Guy Levin from DCMS to DFID. That is unusual: spads are usually personal appointments, and move with their minister. Jonathan Caine is unique as spad to the Secretary of State for Northern Ireland. As predicted in a previous blog post, he is the only spad who has remained in a department in spite of a change of Secretary of State. That may be explained by his previous history: he was a spad in NIO under John Major for five years before being brought back in 2010. Arguably, he is an ‘expert’ spad. But it is worth noting that the pending appointment in DH and BIS means that the Government will soon set a record for the number of spads in government. With fourteen joining and only ten leaving, the number of spads in post increased between July and October 2012 from 81 to 85. But the reported appointments at DBIS and DH as well as potential appointments in the Whips’ office, MoJ and DCMS mean that the number of spads can be expected to reach 87 and perhaps as high as 90, topping the previous record of 85 spads in 2004 under Labour. The rise in numbers may be brought about by the fact of coalition (and the need for greater cross party interaction); and recognition of the need for more politically committed advice and assistance to Ministers. But it is also a product of the rise in the number of ministers in the Coalition Government—especially ministers attending Cabinet. Last weekend, the Public Administration Select Committee (PASC) published its report ‘Special Advisers in the thick of it’. The Committee came out against a cap on the numbers of spads. That was sensible: the focus should be on the effectiveness of special advisers, not their numbers. Spads are here to stay, and the sooner we have a dispassionate and informed debate about their role, the better. But whether or not the public and Westminster observers will agree is a different matter. Nick Clegg’s announcement on 6 August that he is abandoning his bill for an elected second chamber is a serious defeat for the Deputy Prime Minister which also marks a turning point for the coalition. For the coalition, it underlines a point repeatedly made in our book The Politics of Coalition that we have a coalition government, but not a coalition Parliament. Conservative and Lib Dem backbenchers have little love for the coalition, and have rebelled in this Parliament with unprecedented frequency. But because they tend to rebel on different issues, the government’s majority is generally safe. 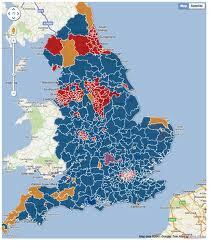 Generally, but not always, as the 91 Conservative rebels signalled over Lords reform. Parliament cannot be taken for granted. Some Conservative MPs will privately be relieved at Nick Clegg’s announcement that the Lib Dems will no longer support the constituency boundary changes, because in the musical chairs involved in shrinking the Commons from 650 to 600 MPs several of them stood to lose their seats. But publicly this retaliation signals a harsher tone between Clegg and Cameron, an end to the spirit of generosity and give and take which characterised the first two years, and a more narrowly contractual approach to their coalition partnership. There is even less hope now for ‘Coalition 2.0’, a mid term coalition review announcing renewed plans for the second half of the Parliament. 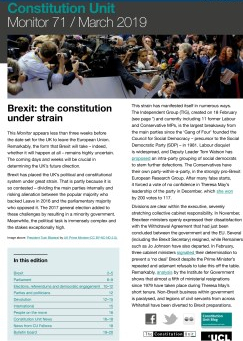 But the dangers of a narrowly contractual approach are twofold: first, that the original coalition agreement will not stand up to that kind of detailed scrutiny, because it was negotiated in such haste after the election; second, that circumstances have moved on since May 2010, particularly in the worsening of the economy. The coalition partners need to keep ahead of the game, and not continually going back to a document now over two years old. Lords reform provides a good example. An elected second chamber is clearly dead, at least in this Parliament, because there is not a majority in either House to support it. 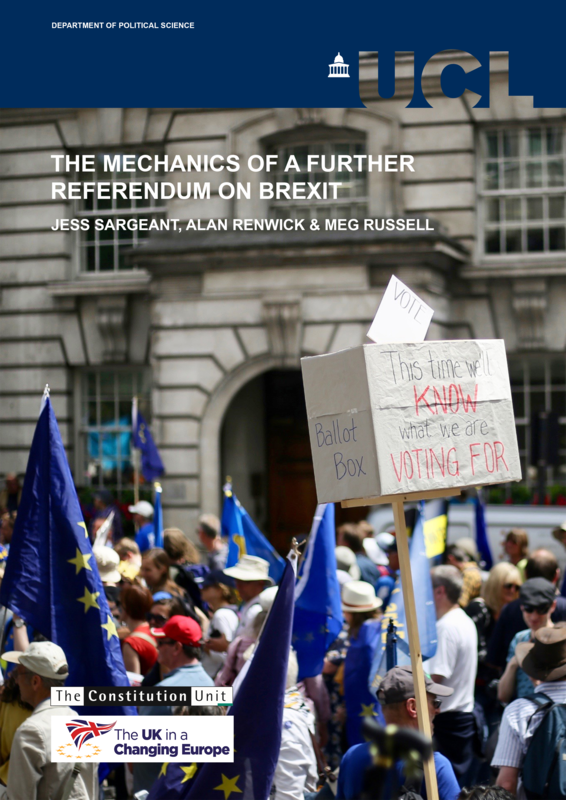 Only a referendum can now overcome the opposition of the parliamentarians; and Clegg should have held a pre-legislative referendum to test the will of the people, as Labour shrewdly did with devolution in 1997. But that is looking back. 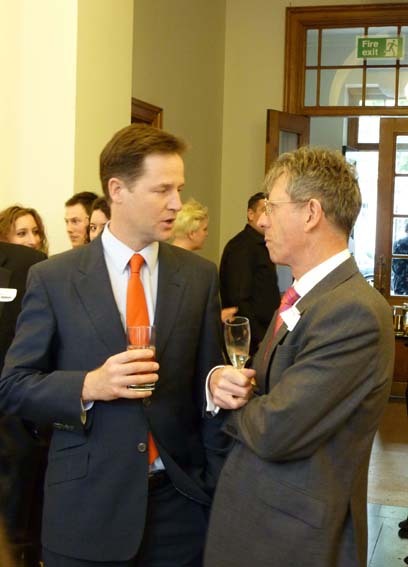 Looking ahead, Clegg need not give up on Lords reform. As his Liberal predecessor David Steel has repeatedly suggested, there are more modest reforms which could be put in place now. These would cap the size of the House, which is ballooning out of control; allow peers to retire; give the House proper powers to discipline its members; and remove the remaining hereditary peers. For these incremental reforms there would be a better chance of support in both Houses. The whole story of Lords reform has been a series of incremental reforms, each building on the last. 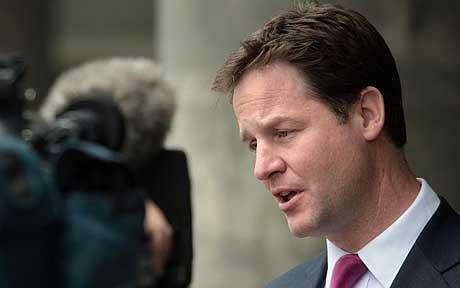 It will be a test of Clegg’s leadership whether he is willing to opt for some reforms rather than none. Following recommendations in our report into coalition government, the Deputy Prime Minister has announced new Liberal Democrat advisors will be placed in government departments. The report, by Prof Robert Hazell and Dr Ben Yong, suggested that the Liberal Democrats have spread themselves too thinly and require additional resources to extend their influence, including more special advisers, expanded Private Offices, and additional support for the parliamentary party. 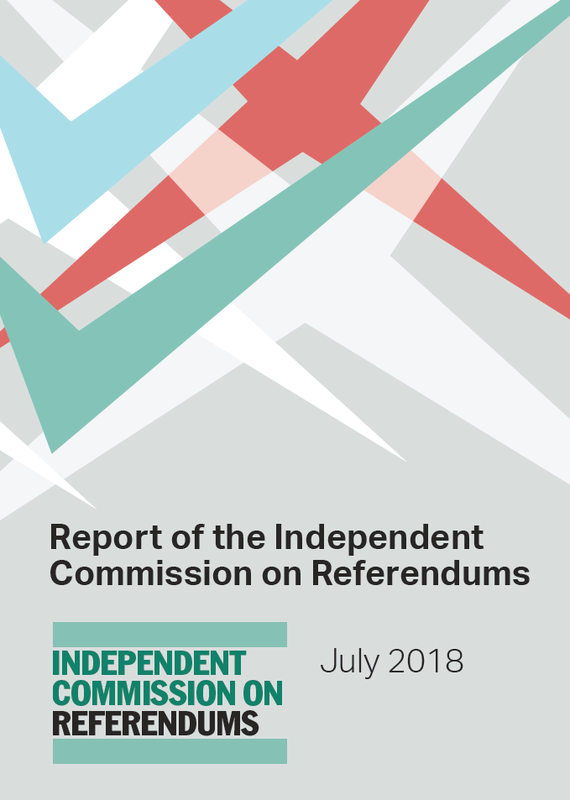 The report is part of a one-year project into monitoring the new coalition government in the UK sponsored by the Nuffield Foundation. 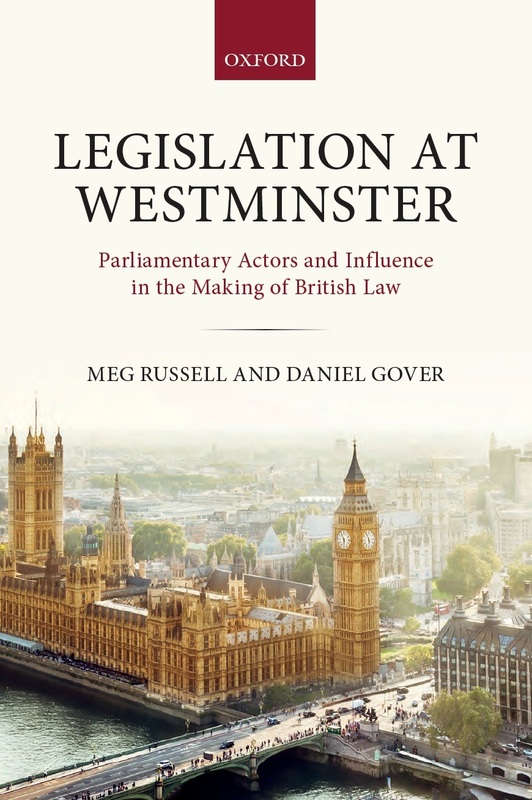 The Conservatives are just as much a party of constitutional reform as the Lib Dems, but this has never been acknowledged, not least by themselves. Nick Clegg in taking the lead on the whole of the government’s constitutional reform programme has taken responsibility for delivering the Conservatives’ reforms as well as the Lib Dem ones. At the end of the coalition government, Clegg will have delivered more of the Conservative package of constitutional reforms than his own. In particular, he will have failed on the AV referendum and on Lords reform, the Lib Dems’ two biggest priorities. For proof that the Conservatives are a party of constitutional reform, see the report which I wrote analysing all the Conservatives’ plans for constitutional change in February 2010. To my surprise it ran to 12 chapters, and can be found here. For proof that Clegg will have delivered more of the Conservative package than of his own reforms, see the table here. It shows on one page the main constitutional reform items in the coalition’s Programme for Government. It is not comprehensive, but it does capture the more important of the government’s constitutional reforms. And it is inevitably a crude score card, in that it lists all the reforms as if they were equal, when some are clearly more important than others. ○ = manifesto commitment only partially incorporated. ‘He will get little credit from the Conservatives for this, because they do not see themselves as constitutional reformers. So he risks being damned by his own side for his failures, and ignored by the Conservatives for his successes’.